After I was finished with the Cushing’s long diagnostic process, surgery and several post-op visits to NIH, I was asked to give the scripture reading at my church. The man who preached the sermon that week was the survivor of a horrific accident where he and his family were hit by a van while waiting at an airport. I thought I had written down the scripture reading carefully. I practiced and practiced. I don’t like speaking in front of a crowd but I said I would. When I got to church, the reading was different from what I had practiced. Maybe I wrote it down wrong, maybe someone changed it. Whatever. “For you, O LORD, have delivered my soul from death“. Others in the congregation who knew part of my story were very moved, too. for all his goodness to me? This Psalm has come to have so much meaning in my life. 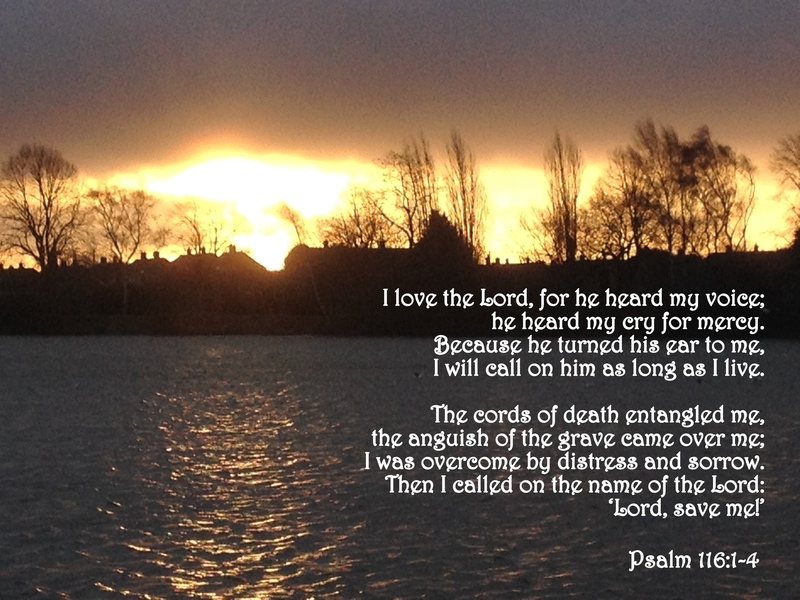 When I saw a book called A Musician’s Book of Psalms each day had a different psalm. “My” psalm was listed as the reading for my birthday, so I had to buy this book! For a while, it was the license plate on my car. I used to carry a print out of this everywhere I go because I find it very soothing. “when I was in great need, he saved me.” This print out is in a plastic page saver but now I have this info on my phone and iPad. On the other side there is an article I found after my kidney cancer. You can read that article in another post.